Clipped this picture out of my YouTube channel line up from 2015 and early 2016. The picture quality is stunning in my view, versus the ones taken late in 2016 when vibration in the camera mount had begun. I’m thinking now that this was my indication of a failing exhaust valve. I’m thinking my adventures might improve now that my airplane is coming back. The week after next I’ll have a new cylinder on my right engine to match the restored exhaust, new baffling, and refurbished propeller on that side. Both engines fired right up last week, even though the right had vibration. I expect the same next week, and Matt and I will go for a ride and see how she flies. After that I’ll be northbound to Wilmington and my hangar. I still have to review the autopilot procedures, since it’s been awhile. I found my own training videos out there on that very subject, and will dust those off and watch a younger version of me teaching me again in the future. Looking at my earlier videos, I spent a few hours today recharging and preparing my GoPro and the Chinese knockoff camera for for use again. The GoPro firmware updated right away, but I could not get the Action Cam to update. I’ll just leave it as it is. I wasn’t going to bother with the cameras at all, but since I realized that the cylinder with the bad exhaust valve might have been the cause of the shaking camera, I wanted to check that out. I’ll mount the cameras and catch the return to flight action at the same time I see if the vibration goes away. I had already been over to my hangar a few days ago to get it ready and drop off a few things. 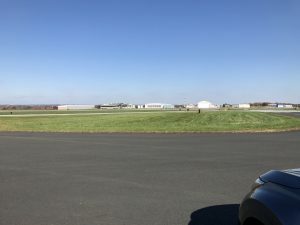 The hangar is in a prime spot at Wilmington airport; close to work and to home. I’ve got a great view of the runways as well, so I’ll have something to look at while I wash and wax. I can’t wait to get the airplane into my hangar and start taking care of it. The spinners haven’t been touched in 2 years! Tomorrow morning I’ll call Red Eagle and try to arrange an IFR Cert; new Aspen Battery; and both Garmin 530 WAAS and Aspen PFD software updates. 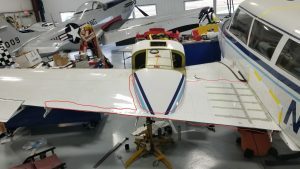 That will leave me with a visit to the paint shop to schedule the paint repairs to the upper and lower inboard wings where all the work was done. Hopefully that won’t be too financially painful, but it has to be done. You can see the affected areas in the picture at right. It would be awesome to wrap all this up before it gets warm and I can travel. No one who isn’t a mechanic directly involved or a pilot willing to accept the risks will be in the airplane with me until I put 50 hours on her. Initially I’ll fly the first 25 hours and then go back and meet with Matt to have the oil filters looked at, and all the bolt torques checked after use. Leaving for another jet trip in a few days, and will attend international training at work around that. December is going to go fast.